Happy Birthday Arabella! 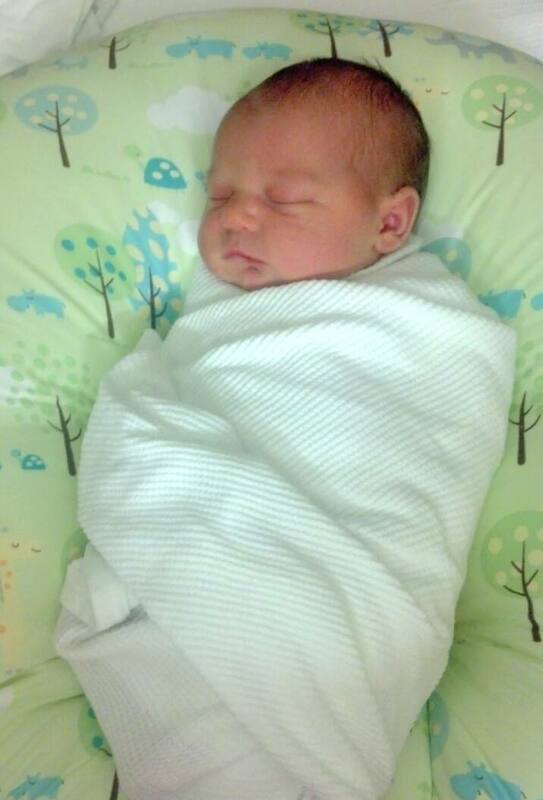 That’s right, it has been one year since my “miracle baby” was born. So many milestones, so many memories… year one is just filled to the top with baby moments that you never forget. Though we did not participate in the typical religious ceremonies such as a christening we still had plenty of fancy dresses and special occasions. I suppose if you want to split hairs we did technically participate in two fancy dress related “religious” events. 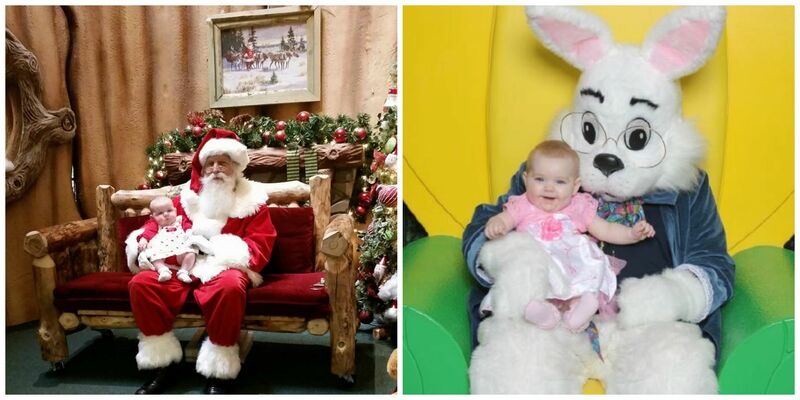 Arabella was able to meet Santa Claus to commemorate her first Christmas and then a few months later she found the Easter Bunny at the very same mall! Now I know there are a lot of Atheists who don’t think “religious” holidays should be observed by nonbelievers… well, Rich and I are not those Atheists. Christmas and Easter are significant for our families, they both bring back amazing memories and we want to pass those along to our child… end of story. If you notice I said we met them at the mall, not a church, a mall. There was not a manger or crucifix in sight, just a jolly old man and a big fluffy bunny, sounds pretty secular to me. I’ve lost count as to how many times religion has tried to sneak into my baby’s first year. Despite my best efforts to not step on the toes of my religious friends and family it seems I managed to somehow offend them with my secular lifestyle. One of the absolute funniest examples occurred around November 21st. 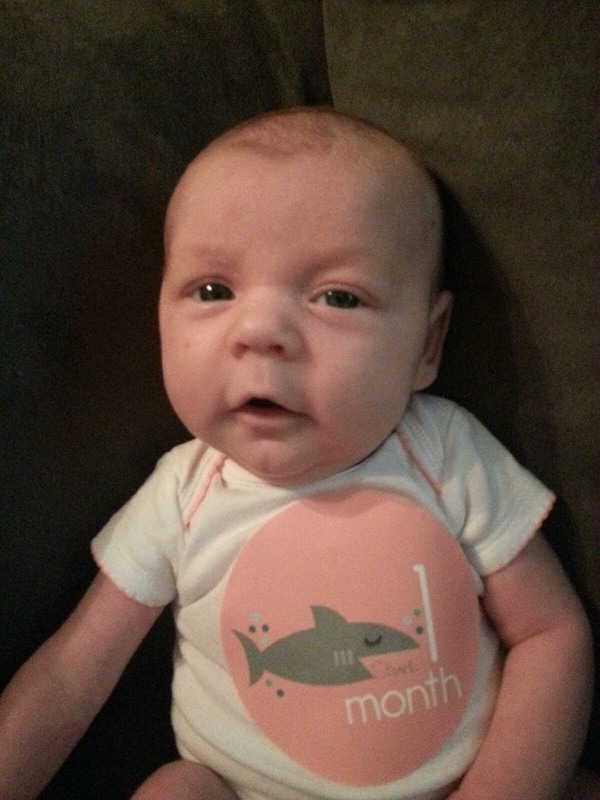 We had been taking photos each month to document her growth, the standard procedure involves a little sticker or sign indicating what month you are celebrating and a stuffed animal for size comparison. I chose some cute stickers that had a different color and animal for each month as well as Arabella’s Charles Darwin doll. It didn’t take long before it was revealed to me that some people were less than pleased to see these shots. I was actually told that they didn’t appreciate seeing my baby next to “some heathen”. Now when I heard that two things immediately came to mind. 1. I cannot believe I am associated with someone who cannot identify the father of evolution. 2. I know this person is not a creationist, I have known them my entire life and do not believe for one second that their fair-weather faith can stretch that far out of the range of sanity. So why were they offended? Would it have been better if I had used her Nietzsche doll or maybe Marie Curie? 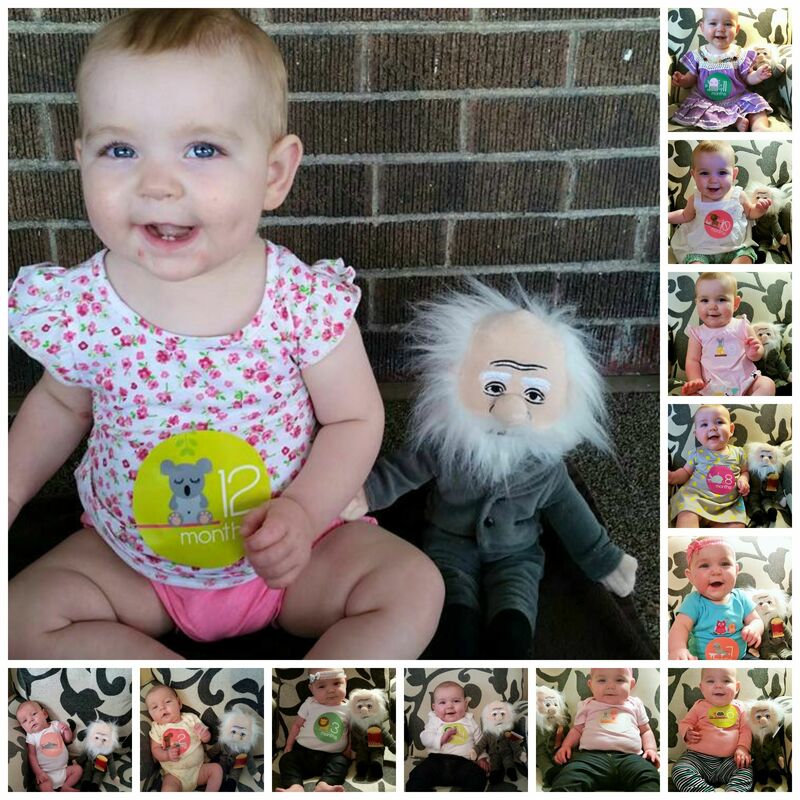 What was it about a plush Darwin sitting next to my baby girl that made their skin crawl. I will never know the answer to this, the discussion will never occur and even if I tried to bring it up, it would just be dismissed. As you can see I did not take their frustrations to heart, I continued my Darwin growth chart and maybe I will never stop. About a month ago Arabella and I were involved in a car accident. I was left with a concussion, eye injury and many bumps and bruises. Thanks to research and development Arabella made it without a scratch on her. In case you didn’t know, rear facing car seats are amazing at protecting our little ones. I was so thankful to the people who invested their time to discover which conditions keep our kids safe from the stupidity of others. Though I may tip my hat to Graco and the other leading companies, not everyone saw it that way. When discussing the accident in mommy groups I was bombarded with prayers for a quick recovery and messages that God was watching over me at that moment, and he kept us safe. Well, as much as I appreciate the well wishes I have to say that not even a traumatic brain injury can make me believe that God saved us that day… nope it was seat belts, car seats and having the speed and impact happen to combine in a way that left us able to live another day. One year down and a lifetime to go, I have to wonder what challenges I will face trying to raise Arabella to be a strong, secular woman in a world that doesn’t always promote acceptance. Though our parental instincts make us want to protect our children I have no intentions of shielding her from the world. I want her to learn about the beliefs other people hold, to understand reasons why they feel the way the do and to acknowledge that it is okay for people to hold different beliefs. I want her to find that you don’t need to define a friendship, we can love and care for those who do not follow the same path and be supportive of them without betraying our own values. I am still working on all of this myself, I try my best each day and know that it can only get better as I am now setting an example for my child. 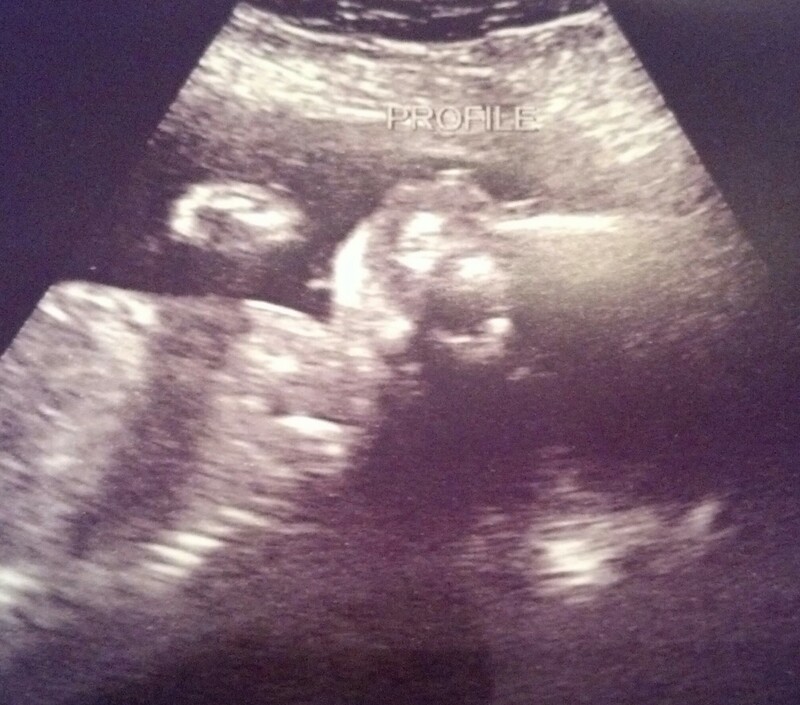 Here is the latest picture of my little thinker, Arabella… you just can’t beat the hand on the chin, am I right? This was taken on April 1, 2014 when they performed a biophysical profile. Baby passed with flying colors receiving an 8 out of 8. She was moving around like crazy, practicing breathing and her heart rate was strong, just like it always is. The doctors were incredibly impressed considering that I was only 24 weeks at the time and wasn’t even feeling her movements yet. The first kick I did feel came just a few days later and now the amazing feeling happens like clockwork. Going along with her incredible development was another milestone, Arabella has reached the “viable fetus” stage, which means that if I was to go into labor and have to deliver her, most likely she would survive. When I told my father about this important stage of pregnancy he said “I don’t think that they had a viable fetus stage when your mother was pregnant”. In fact he is correct about this, it was not so long ago that a baby born earlier than 37 weeks (the earliest “full term”) was put into an ICU, given oxygen and fingers were crossed in hopes baby would survive. Thanks to scientific research and advancements we now have much more time than we did before…and even a baby earlier than 27 weeks has a fighting chance. Treatment is now so specific that premies are put into one of 3 categories: Late preterm (34-37 weeks), Very preterm (less than 32 weeks) or Extremely preterm (less than 25 weeks). The slew of tests that can be run on a premature baby to determine exactly what it is experiencing is overwhelming. From ultrasounds of the brain to pediatric respirators we are leaps and bounds ahead of where we were before. Another big moment we experienced was not quite so positive, but I can still thank science for helping put my mind at ease. I had to go to labor and delivery because I was experiencing incredibly painful contractions. It took about seven hours of being closely monitored and pumped with fluids before they went away, apparently Braxton Hicks contractions can be brought on by dehydration…and silly me, I didn’t even know I was dehydrated. The part of the experience that amazed me the most was the fetal fibronectin test which allowed them to determine if it was labor or not through a swab of my cervix. 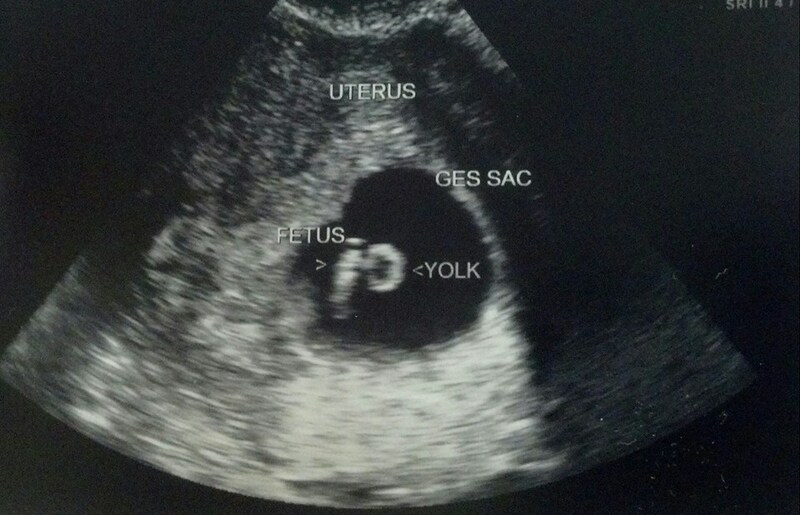 Even though I was petrified by the contractions this tiny test gave us a 99.9% negative on if it was true labor or not. Once I knew I was in the clear the relief was overwhelming. Sure I was still in pain, but I knew baby was not leaving the womb and that was all that mattered. So now as I finish writing this baby girl is kicking away and it feels amazing. Thank you science for keeping me and baby safe. Well, it is official, we are having a little girl. 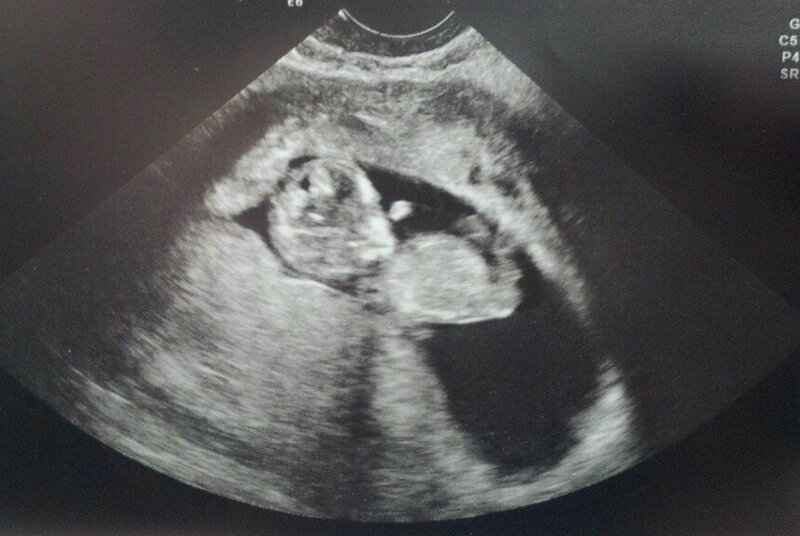 Arabella Lorelei is still due July 22, 2014 and she is developing perfectly. The anatomy scan was amazing.The baby is only half a pound and yet we can observe the kidney function, watch the blood flowing through the umbilical cord and see baby open and close her mouth all while doing little flips and twists right there in my tummy. I understand that ultrasounds have been around for quite sometime, but the advances in technology have been vast and the certainty with which health care providers can give out information is astounding. Arabella will be the first child in a long line of family births to not be baptized simply out of tradition. The topic hasn’t caused a stir as of now, though to be fair, we have yet to discuss it with those who will care. However, I am sure that once baby arrives the backlash will begin. No matter what we encounter from either side of the family, I assure you that the Couple of Atheists will not back down. I know that some people will say that we should not sacrifice the baby’s “soul” simply because we choose not to believe… or that because of our atheism the ceremony is meaningless and should be viewed as drops of water and words… with a chance at redemption of her soul should me and Rich turn out to be wrong. Well, that is fine for some, but I take a different view. I believe that participating in this, or any inherently religious ceremony, is disrespectful to those who do believe. Unlike many relationships, there is no internal conflict between Rich and myself and therefore no reason to compromise our ethics simply to appease others. I also do not view this as keeping Arabella away from God, but more not forcing God onto her. If at any point she finds that a life of faith is right for her, that will be fine, but I will not pressure her into something that I do not find beneficial to life. Despite having one openly Atheist parent, I was baptized, confirmed and made my confirmation within the Catholic church… and though this did not instill a belief in Christ, it forced onto me the stigma of being Catholic… and I won’t do that to my child. As I watch the development of the baby progress, I begin to think more of her future. I know that we are going to encounter many situations along the way where the faith of others will attempt to overstep and cross the bounds of our rights as parents. There will be compromise at times, but not to the point that our family forgets what we believe in. And if you really find fault in a secular, humanist household, well I encourage you to keep reading and prepare to change your mind. As you can see there has been a lot of action since I last posted about baby. I am now just over 3 months and everything is right where it is supposed to be. I have been experiencing a range of reactions to this pregnancy, most of which are supportive, loving and filled with excitement, and a few… not so much. Much to the contrary of what you would expect I have not had a single believer speak ill of pregnancy. It doesn’t seem to matter to them that me and Rich are not married or that we are Atheists who plan to raise the baby with secular values. No, the only harsh reaction came from a member of my local Atheist community… and I was admittedly unprepared as, after-all, everyone loves a pregnant lady. Maybe not. At our monthly brunch, a member of the local community expressed that they are reluctant to speak of my pregnancy, stating that 2% of babies die at birth (this is not true) and that they will “celebrate it once the baby is born”. This came from a dark place, a very unfortunate experience that they had for which I feel very sorry. However, I am an optimistic person- I know that anything is possible and any number of things can go wrong- but I refuse to focus on that. 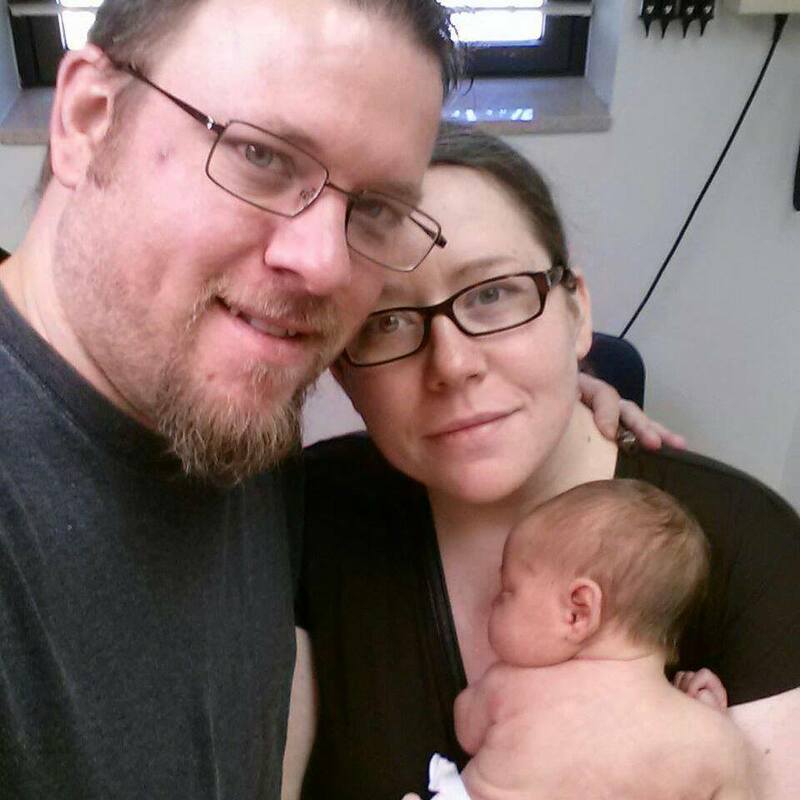 I am so lucky to have become pregnant in the first place (thanks again science!) 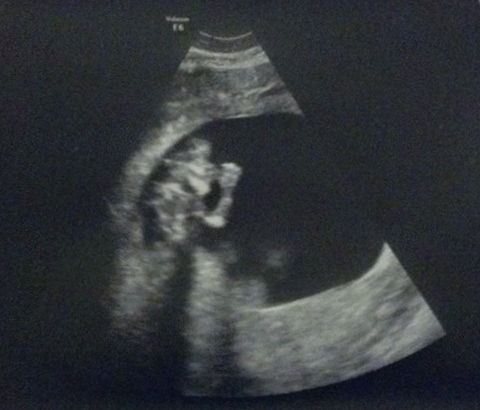 that I intend on celebrating every minute of this baby’s life…and yes, the fetus inside of me is very much alive. So onto the good stuff… here is what science has offered up for celebration since the last time I wrote. 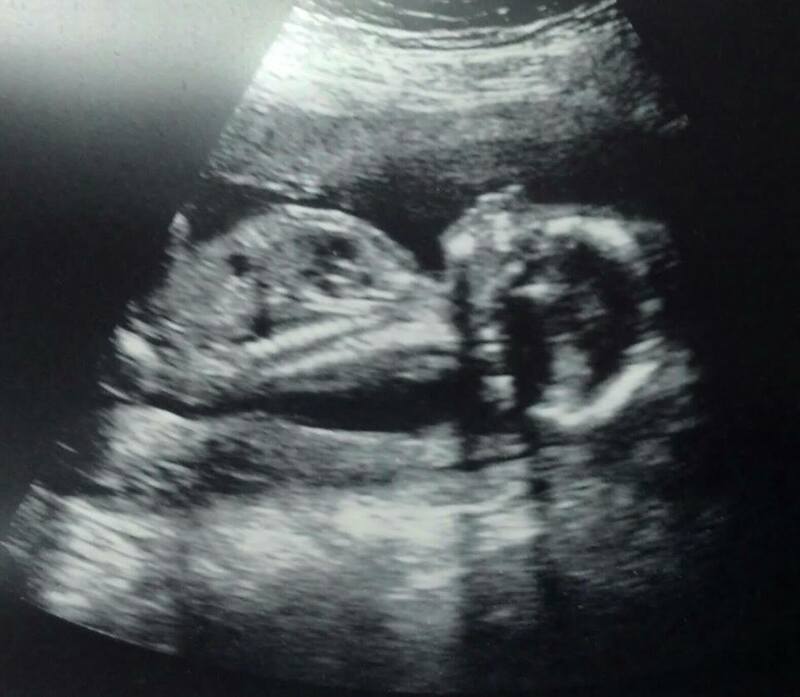 On December 30th I had the ultrasound that produced the pictures you see. 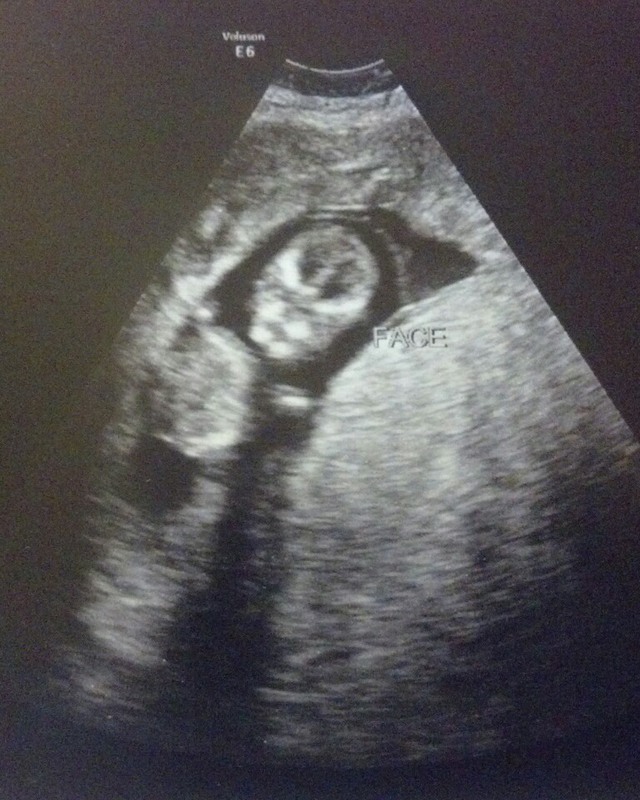 During this sonogram the technician made a comment that just made me laugh inside. 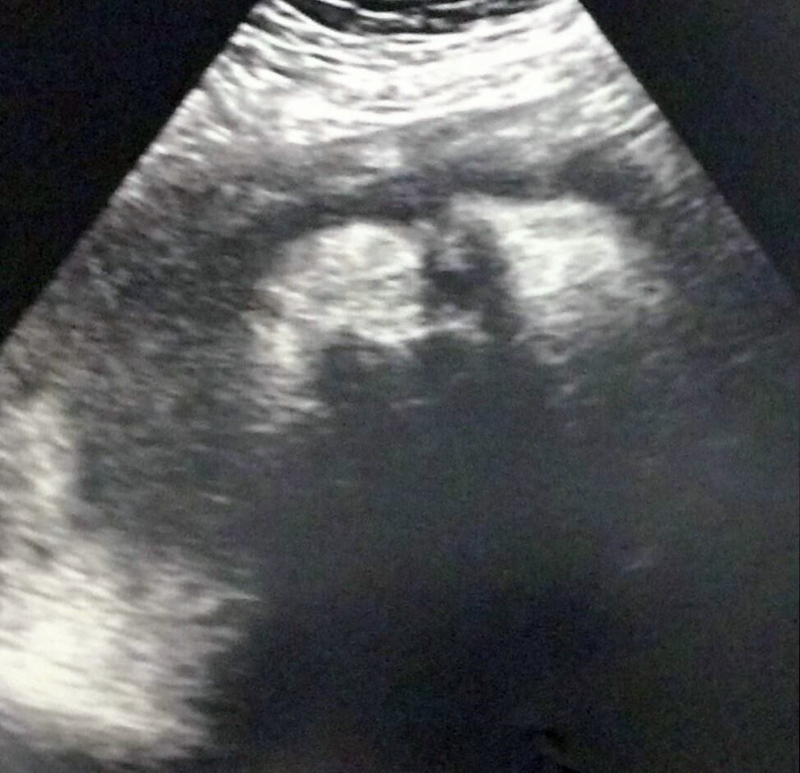 Everything was going along as normal, baby moving like crazy and me being more excited than ever in my life…but then the above image was captured and the tech exclaimed “Look, the baby seems like it is praying!”. Of course in my mind I was thinking “Well it isn’t, the baby has no knowledge of God or prayer.”, but to her face, I just smiled as I could tell that she felt she was being sweet. After that moment passed, she continued on, showing us the cord blood flowing, the face and even the baby’s brain. I cannot believe how clear the images were. Instead of that blurry image mother’s had in the past- I could see each part that was pointed out. This is undeniably the result of science and technology. First ,it is only within the last 25 years that we have had transvaginal ultrasound technology, and in 2014 it is far better than it was when it first came into mainstream use. It makes it possible to zoom in and create images like the one below, where at 10 weeks 6 days the hemispheres of the brain are clear as day. Another example of science and technology performing as God never could happened just 2 days ago at my first trimester screening where they check the risk of Trisomy 21 (Down syndrome) and Trisomy 18 (Edward’s syndrome). This test consists of 2 parts- an ultrasound (Nuchal Translucency screening) in which the thickness of the nuchal fold area is measured and also a blood test. My ultrasound results were available immediately and the doctor said everything was excellent, my blood work is not back yet, but it is unlikely they will reveal anything but the same as the ultrasound. Isn’t it amazing that in today’s world we have ultrasound technology and research available to give an immediate assessment of the risk of these syndromes? Some people find them controversial, thinking that unfavorable results will make for an unhappy pregnancy or even tempt the mother to abort the fetus. I do not see this as the case, and a dear friend of mine said it best, that tests like this “allow us to mourn the baby we imagined having, and prepare for the baby we now have… so our first moments after birth can be spent with love and happiness, as they should, rather than shock and fear. ” . One final milestone occurred on the 2nd of January, where we heard the heartbeat for the first time. It was the most amazing sound I have ever heard and made me immediately wish that I had an at home doppler so I could listen to it all of the time. Yes, science and technology has given us that option, but alas, it is too far out of our price range- so we will have to hold off the next time the doctor takes a listen. Until then I will continue to celebrate the life inside of me and share it with those whom I love and who love me.